The chocolate variety pack includes 8 bars total: 2 chocolate sea salt, 2 coconut chocolate, 2 coffee chocolate, and 2 mint chocolate. Made with pure chocolate (aka 100 percent cacao), the chocolate variety pack is the perfect way to try all 4 chocolate variety rxbars, each containing, 12g of egg white protein, 8 or less whole food ingredients, no gluten, dairy or soy and has zero added sugar. Rxbars are perfect as a convenient breakfast, on-the-go snack or as pre-or-post workout fuel. 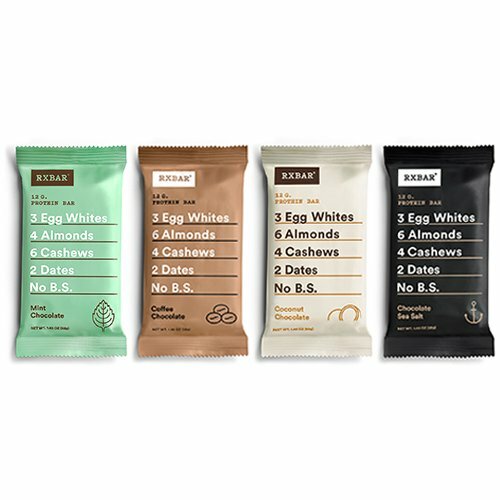 Rxbars are whole food protein bars made with egg whites, dates, nuts and natural ingredients like 100 percent cacao or blueberries to provide added taste and texture. No added sugar, no gluten, no soy, no dairy, no gmo, no B.S Each flavor contains antioxidant-rich pure chocolate (aka 100 percent cacao), 12g of egg white protein, 4g of fiber, 200-210 calories. Perfect as a breakfast bar on-the-go, a pre- and post-workout bite, or a convenient and healthy snack between meals. Each chocolate variety pack contains 8 protein bars; 2 chocolate sea salt, 2 coconut chocolate, 2 coffee chocolate, and 2 mint chocolate. See below for links to other variety packs including: variety pack - all flavors (12 bars), best seller variety pack - 6 flavors (30 bars), 3 flavor variety pack (8 bars), and whole30 compliant variety pack - 5 flavors (30 bars). If you have any questions about this product by RXBAR, contact us by completing and submitting the form below. If you are looking for a specif part number, please include it with your message.